Way back before Mommy was Mommy, when she was just Sarah or or Miss Perone or Mrs. Ludwig, she registered for a Chicco Cortina Travel System. It sounded like such a good idea – a stroller that she could just snap my infant carrier into? Fabulous! An infant carrier to take me all the way to 30 pounds? Sounds good to me! Mommy was very lucky to receive her travel system AND an extra base at her shower – so I could easily go in both her car and Daddy’s. The stroller doesn’t really fit into the trunk of her silly little two door coupe – and there was NO way it was getting schlepped up and down the three flights of stairs from our condo to the parking lot on a regular basis – so it lives in Daddy’s car. As such, Mommy doesn’t really have access to the stroller for our regular day-to-day errands and such. Carrying me around in the infant carrier was okay for a little while, but as I got heavier it quickly got old… Mommy is not sure who is lugging 30-pound babies around in these things, but she has never been a body builder so it’s not going to happen in our family – even Daddy needs a break when he’s carrying me up the stairs! Enter the Moby. Mommy first discovered the Moby when I was suffering from acid reflux and could not stand to be put down. She needed *something* to be able to carry me around all day so that we were both comfortable and so she was able to get things done. After a brief dalliance with a Hotslings carrier (it was a bit too cramped and forced me to be horizontal, which I don’t like), we gained the confidence to try the Moby. (It looks WAY more complicated than it is – Mommy wishes she had tried it sooner!) Voila! Comfortable, happy, and hands free baby! While Mommy is sure she will get plenty of use from our stroller, especially as I get bigger, right now the best way for us to get around is with a wrap. I am SO happy in there – I can look around when I want to, and when I get sleepy I can snuggle in for a nap. Mommy’s happy, too – it’s so much easier to move around – especially in tight spaces… and she can get to other levels of stores without searching out the elevator. With the wrap, I can go EVERYWHERE! Mommy even took me to build and paint sets at school with her students – twice! Hmmm…. Mommy might want to consider wearing make-up on a more regular basis if I am going to be posting pics of her on the interwebs! I’m beginning to explore the world of woven wraps – the Moby is stretchy and as I get bigger will no longer be quite so supportive. 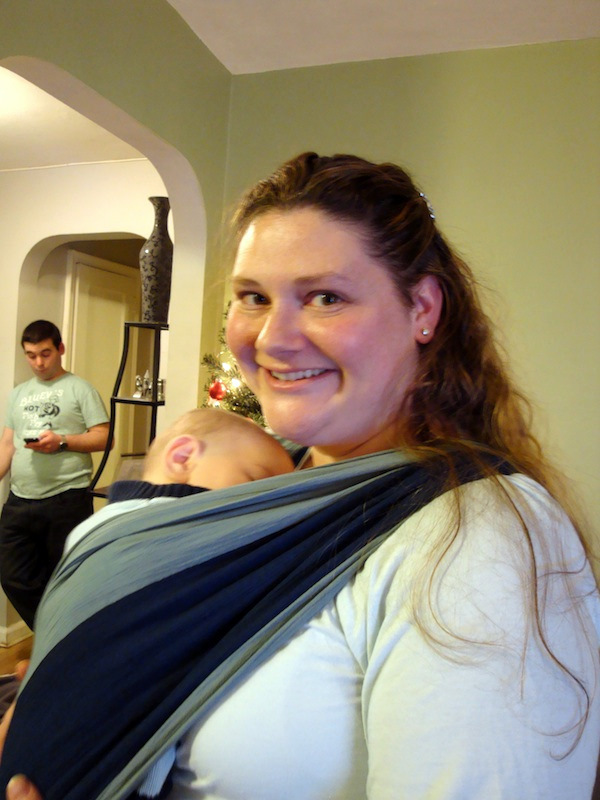 Here’s Mommy and me in our Wrapsody BaliBreeze: We will, for sure, be posting about more babywearing adventures… Mommy is looking forward to trying back carries (HA! I spit up down her shirt! ), a water wrap (for the shower! for the pool! CAN’T WAIT to go to the beach! ), and other types of carriers (Daddy wants one he doesn’t have to “learn boy scout knots” to put on).